High intensity trauma in the periocular region can cause serious damage to the ocular and related structures. The most frequent causes of this kind of lesion are sports injuries, traffic accidents, wounds from armed conflict and other violent situations, serious burns and dog bites. A sufficiently severe trauma in the eye can lead to serious damage to the internal structures of the eyeball that may result in permanent loss of sight. When the impact is not so severe, there may be intraocular haemorrhaging, cataracts due to trauma, glaucoma or retinal detachment, situations that can usually be treated and with a good prognosis. The most serious situation is when the eye is perforated or bursts as this disruption in the ocular walls entails a high risk of sight loss and of the viability of the eyeball if it's not treated urgently by surgery. Occasionally, the disruption to the eye's structures is so severe the eyeball is lost. 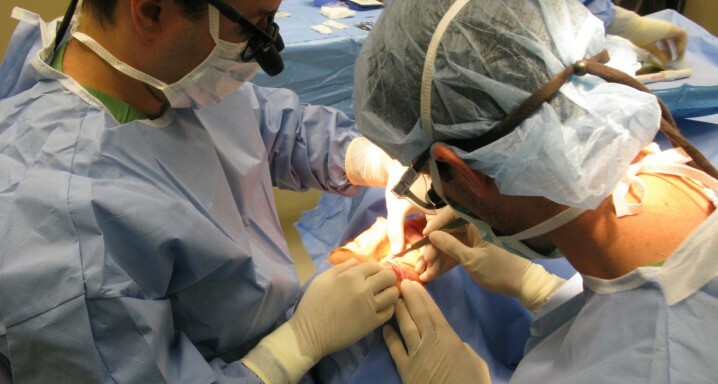 In these cases our treatment focuses on the patient's aesthetic rehabilitation by implanting prosthetic eyeballs that can perfectly imitate a healthy eye. Eyelids can also be seriously injured in accidents or trauma. The most common are simple lacerations, which can generally be treated easily via surgery. Sometimes tear ducts may be severed and require reconstruction. The most complex palpebral trauma, involving a loss of tissue, may be difficult to treat as there can be severe scarring in addition to the trauma of the injury per se. In the vast majority of cases an acceptable recovery can be achieved, both in functional and aesthetic terms, via the use of advanced eyelid reconstruction techniques. High energy impacts on the orbit of the eye can cause fractures that most frequently affect the bottom and internal wall of the orbit. In many cases these need to be repaired as they can displace the eyeball within the orbit towards the paranasal sinuses, producing enophthalmos. They can also cause double vision when the ocular muscles are trapped in the fracture. In this last case, surgery must be carried out as soon as possible to prevent this double vision from becoming permanent. Most orbital fractures can be repaired using minimally invasive surgery via the conjunctiva, without leaving a scar on the skin. More complex traumata that may involve the eyeball, eyelids or orbit often require more than one operation to achieve the desired functional and aesthetic result.